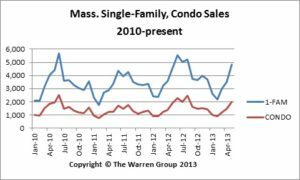 BOSTON, June 25, 2013 – Home sales in the Bay State increased more than 6 percent in May – rising to the highest level of transactions for the month since 2006, according to The Warren Group, publisher of Banker & Tradesman. A total of 4,820 single-family homes sold in May, up from 4,540 the same month a year ago. This is the highest number of transactions recorded for the month since 2006 when there were 4,948 sales. May is the first month since January that sales volume increased year-over-year. However, year-to-date sales are down slightly. A total of 16,068 homes have sold so far this year, down 0.19 percent from 16,098 during the same period last year. The median price for single-family homes sold in May increased almost 12 percent to $324,500 from $290,000 a year ago. This is the highest median sale price recorded so far this year. Year-to-date, the median sale price of a single-family home in Massachusetts is $300,000, which is 11 percent higher than the $270,000 median price recorded during the same period in 2012. 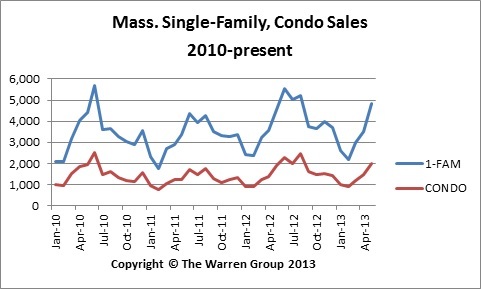 The median sale price of a condominium in Massachusetts was $295,000 in May, a 2.2 percent increase from $288,675 in May 2012. The year-to-date median condo price rose 1.6 percent to $270,000 from $265,750 during the same period last year. For the second straight month, condo sales increased. Sales rose more than 5 percent to 2,015 from 1,909 in May 2012. A total of 6,561 condo sale transactions were recorded in the first five months of the year, a 3.4 percent jump from 6,348 the prior year.